Decompression is believed to relieve pressure that builds up on discs and nerves. The task of relieving pain is thought to come about as a result of drawing areas of bulging and herniated disc material back into place. The theory of how decompression accomplishes this is by creating negative pressure within the disc, referred to as negative intradiscal pressure. Designed essentially to create a vacuum, the theory is that it draws the bulging and herniated disc material back into the disc space and relieves pressure. This procedure is called non-surgical Spinal Decompression and has been very successful in the treatment of herniated discs. This is truly a medical breakthrough now available locally. As the ligaments that hold disc material in place become stretched or torn due to bulging and herniation, decompression is believed to assist the ligament bands that hold the disc material in place to heal, preventing future recurrence. When pressure builds up inside the disc, it causes bulging of the jelly-like disc material. With increasing or prolonged pressure, it often leads to a disc rupture or herniation which spills out the disc material. The bulging or spilled out disc material is what puts pressure on the nerves and other structures that cause pain. This pain can travel into the buttocks and down the legs/arms or into the toes/fingers. It can cause numbness and also lead to dysfunction. What is the Treatment Program? How long does it take? The primary goals of the physician are to make an accurate diagnosis and thoroughly inform the patient of their condition so they completely understand their options for care. It takes into consideration the diagnosis, severity of the condition, level of risk, accompanying factors and any complexities that may be involved. A typical treatment program is spread over 1 to 3 months. The procedure has had great success in treating herniated discs and even greater for other conditions with most patients becoming well or better. We will provide instructions for home self-care and recommend any restrictions of work or activities as part of our patient education program. Patients come to us for the relief of pain and to live their lives to the fullest and thats what we give them. What is the Decompression Program? Decompression is an effective spinal rehabilitation program for conditions of the spine (primarily low back & neck), with focus on chronic and severe cases. The program consists of FDA cleared non-surgical spinal decompression therapy focused on decompressing the discs to reverse high amounts of pressure built up inside the discs to take pressure off of the nerves. Support is provided to assure the patient is comfortable during care. What kind of conditions does the Decompression program treat? Disc problems of multiple varieties as bulging discs, degenerated discs, herniated discs or ruptured and protruding discs of the cervical (neck) and lumbar (low back) spine, as well as joint arthrosis, facet syndrome, sciatica, mild spondylolisthesis and stenosis. Non-Surgical Spinal Decompression has had great success with patients suffering from herniated intervertebral discs. Its even greater for other conditions. At Lupo Chiropractic, we have an excellent success rate because we only accept patients who we truly believe we can help. Non-Surgical Spinal Decompression has had great success with patients suffering from herniated intervertebral discs. Its even greater for other conditions. At Lupo Spinal Aid Center, we have an excellent success rate because we only accept patients who we truly believe we can help. What is the cost for the decompression therapy? Good news! The cost is reasonable and we provide everyone the opportunity to receive decompression therapy. Weve eliminated the worry of finances by offering generous discounts on pre-payment, no-interest and flexible payment plans and we also offer financing at low rates so everyone can now afford the scientific discovery of non-surgical Spinal Decompression. Patients can now take virtually as long as they like to pay for their care. During your consultation, the doctor will determine if you are a candidate and fully explain to you how much it will cost before starting care. What is the difference between Spinal Decompression & Traction? Spinal Decompression is a much more sophisticated technology which overcomes the bodys resistance to traction. In terms of herniated/bulging discs, nowadays, traditional traction is actually contraindicated. Traditional traction protocol hasnt really changed since the 1970s. The technology that spinal decompression is based on was created in conjunction with studies from NASA. In other words, the analogy is its like the difference between a typewriter vs. a computer. To put it simply, traction is where they attach harnesses to you and literally try to pull you apart. However, in your problem areas, you have hypermobility in the ligamentous tissues. (ex: disc bulge, anterolisthesis..) With traction, it tears the white & yellow annular ligaments even more, making them even further hypermobile or loose. 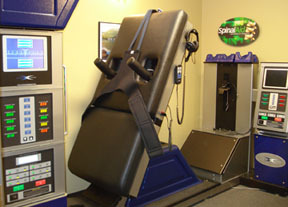 Our state-of-the-art, computerized Non-Surgical Spinal Decompression unit isolates the areas and intermittently (on & off) milks the fluid back into the disc. The key, is that it doesnt overload the bodys Golgi Tendon Apparatus, which is the bodys protective mechanism when its pulled upon. Our unit has a closed-loop feedback system which constantly senses the body many times per second, adjusts tensions accordingly in order to relax and confuse paraspinal muscles and allow distractive forces to decompress the intervertebral disc space. Its these sophisticated mechanisms which make it possible to apply the distractive force in a non-linear or logarithmic fashion. (Unlike simple traction). This is the key to achieving true spinal disc decompression, and creating a negative pressure within the spinal disc. When there is laxity of ligamentous tissue, it means there is total fatigue at the hypermobile area. The problem with traction is that it overloads the bodys Golgi Tendon Apparatus and can actually tear the tissues. Thats why traction is no longer recommended for disc injuries, and is one of the most frequent causes of malpractice in hospitals. Finally, a program exclusively designed to stabilize and strengthen the core muscles of the spine to relieve and prevent back pain recurrence after you have completed a course of non-surgical spinal decompression therapy. Amazingly, studies reveal that the muscles of the back called the multifidi, atrophy in 80% of patients with back pain. Non-surgical spinal decompression focuses on the discs and tissues surrounding the vertebra. The theory behind non-surgical decompression is to create a vacuum to draw back in bulging & herniated disc material, as well as help to increase disc height and hydrate the tissues. Our Theratronics Back Pain Relief Program is intended for patients to strengthen and maintain the spinal muscles after decompression therapy for the disc(s) is completed. In essence, the non-surgical decompression component focuses on the discs while the Theratronics Back Pain Relief Program focuses on the muscles of the spine. An educated patient is the most likely to make the right decisions regarding their care and treatment options and obtain the most favorable results. It is often necessary and highly recommended for those who suffered back pain, to undergo a specialized muscle strengthening program referred to as core strengthening. It is named core because it focuses on the core muscles that support the spine. It includes a combination of physical activities of specific muscles of the core to stabilize and strengthen them. When muscles and tissues of the spine are injured, damaged or weakened, they must be exercised to return to normal strength as before the problem occurred. The Theratronics Back Pain Relief Program is a post decompression program prescribed whenever strengthening of the back, stomach and core muscles is desired. The Theratronics Program is different from conventional physical therapy. It is not intended to stretch or limber up muscles, rather it is an intensive program which targets specific back muscles weakened from disuse and puts them through an isolated workout. We consider it a boot camp approach to strengthen muscles of the back and the approach makes a real difference. Research has shown that people with back pain have a tendency to favor the weakened muscles and recruit other surrounding muscles to compensate. The favored, pampered or unused muscles begin to atrophy within two (2) days. This makes them more vulnerable to further weakness and injury, exacerbates back pain and triggers a self-perpetuating chronic cycle of muscle deconditioning. After the disc undergoes decompression, the involved, weakened back muscles must be identified, isolated and then exercised to build up the muscles of the spinal column. This is critical to aid in healing and maintaining a healthy spine. We recognize the importance of stabilizing and strengthening the muscles of the spine utilizing specialized equipment. We also observed that people who had chronic back pain are often afraid to engage in physical activities including exercise, core strengthening or rehab. At Lupo Chiropractic, we do not put our emphasis on the specialized equipment, we focus on you. We literally have your back, so to speak. We understand what you are going through. People come to us not only for the relief of pain, but to enjoy their lives again and thats what we give them. After completing a course of decompression therapy at Lupo Chiropractic, its now time to ensure that you maintain the maximum, long-term benefits from your treatment and reduce the risk of recurrence. Once your tissues reach the final remodeling stage of healing, which helps form the final matrix of the newly regenerated tissues, youll want to ensure that the benefits will continue. Quite simply, to ensure that you live the rest of your life free from back pain and avoid recurrence. In the medical profession, its termed maintenance. Weve put our own twist on it and call it our Spine Longevity Program. Lupo Chiropractic recognizes that you must isolate the specific spinal muscles. You need a special machine to do that. You also have to stabilize the pelvis through the use of a special machine as well. These machines are found in doctors offices, not gyms. It was also discovered that only those patients who used these machines were able to strengthen their spinal muscles. And lastly, the machine and special exercise increase bone mineral density in those over age 50, helping osteoporosis. At Lupo Chiropractic, even though the special equipment is necessary, we put our emphasis on our patients. We focus on our patients literally to help them get their backs back. Were confident our Spine Longevity program is perfect for maintaining the strength of your spine muscles with ease and in the comfort of a physician supervised environment. We promise to be the best physicians we can to make your maintenance scheduled visits as much of a fun experience as we can. Its maximum results in the most convenient setting and were sure youll enjoy the experience and the rest of your life.